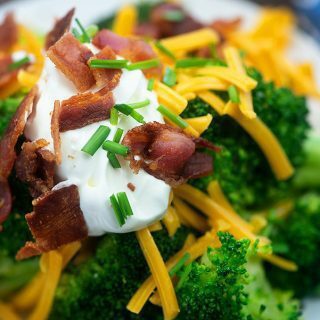 Loaded broccoli has all the things you love about a baked potato, but it’s low carb and oh so much better! I have to admit that I feel a bit strange sharing this one with you guys. I mean, it’s barely even a recipe. It’s more of an idea. Granted, it’s an idea that I think you’re all going to LOVE, but it still seems like a strange thing to share here. 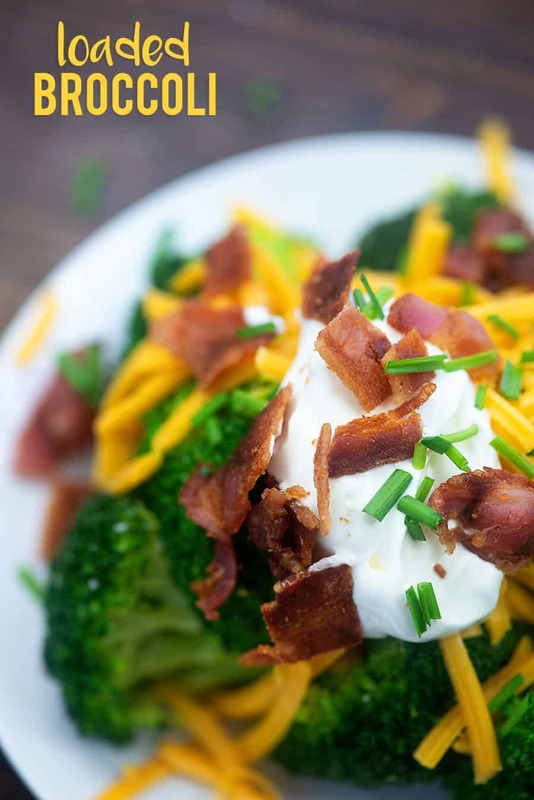 So my husband and I love loaded baked potatoes, but the truth is that we mostly just like the cheddar, sour cream, and bacon topping the potato off. And so now we skip the potato altogether and just put that goodness on a pile of steamed broccoli. This is perfect for nights when you just really need something indulgent and delicious. We even order loaded broccoli when we go out to restaurants. It makes that side of broccoli so much more exciting. 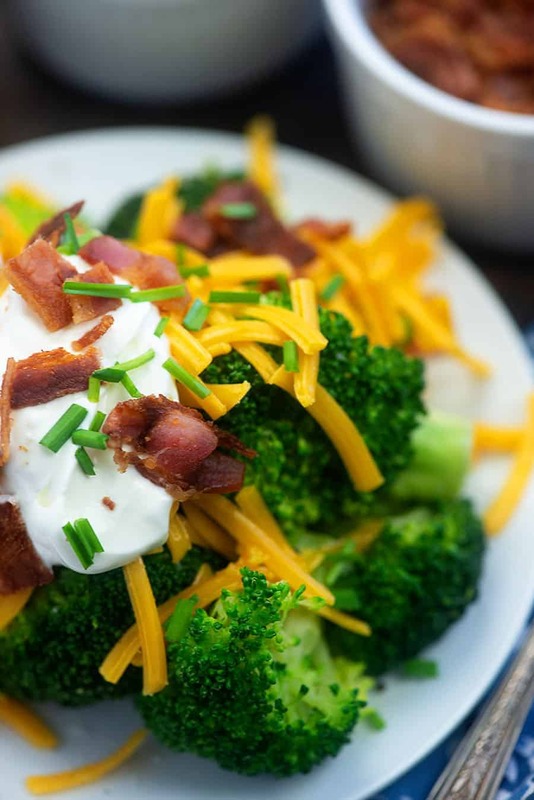 There are many ways to cook broccoli, but we prefer to steam the broccoli for this recipe. You can do this on the stove or in the microwave. You’ll need a steamer pan for this. I use this one and love it. We steam vegetables nearly every day, so it gets plenty of use in our house. Bring the bottom pot of water to a boil and place your broccoli florets in the steamer insert. Put the steamer insert over the boiling water, cover the pan, and steam! We prefer broccoli to still have a bit of crunch to it, so we steam for about 5 minutes. The longer you steam your broccoli, the softer it will get. 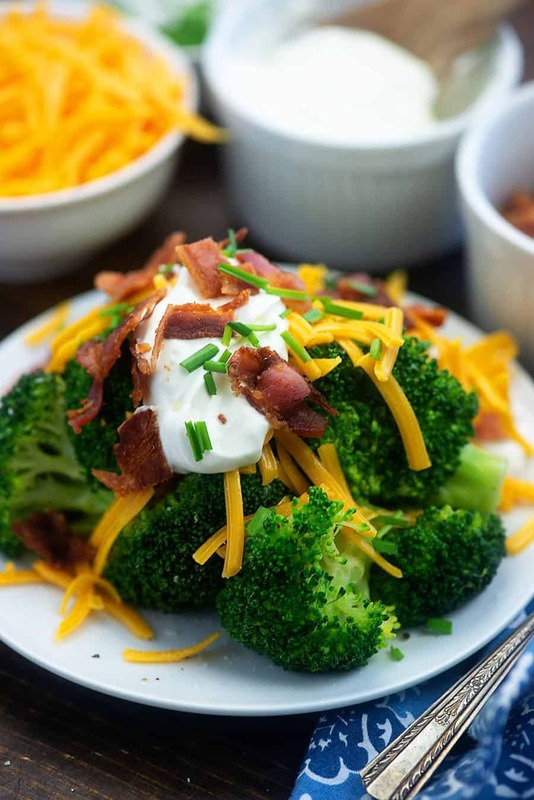 Add the broccoli florets to a large microwave-safe bowl and add 3 tablespoons of water. Cover the bowl tightly with plastic wrap. Did you know that plastic wrap sold in America is microwave safe? I’m not sure about plastic wrap from other countries, so do check if you’re outside the US. Once the bowl is tightly covered, place in the microwave and cook on high for about 3 minutes. Again, the longer you cook the broccoli, the softer it will get. Be very careful removing the plastic wrap from the bowl as there will be steam trapped inside and it hurts to steam your fingers! Start piling on all of your favorite toppings. You can add a layer of butter if you like, but we normally skip it and go straight to the cheese. Freshly grated cheddar is best and when you put it on first the heat from the broccoli helps it get a bit melty. Scoop on a big spoonful of sour cream. Top it off with crumbled bacon. Finish it all of with some minced chives. This is seriously just about the easiest thing and it’s SO good. Hope you give it a try and love it as much as we do! Loaded Radishes: Same concept, but with fried radishes! Italian Cauliflower Salad: This salad is packed with good things like fresh veggies and tons of pepperoni and salami. Loaded Cauliflower Casserole: So creamy and cheesy! Broccoli Casserole: So indulgent and creamy! We love this broccoli casserole. Skip the potatoes and load your broccoli with the good stuff instead! Add the broccoli to a steamer basket set over boiling water and cover. Steam for 5 minutes or until broccoli is as tender as you'd like. 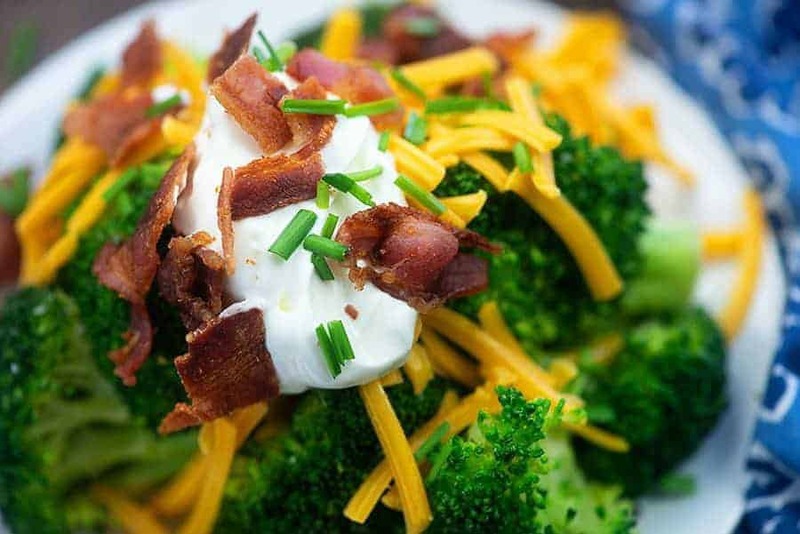 Divide the broccoli between four plates and top with the cheddar, sour cream, bacon, and chives.